Our 425-page eBook offers you superb value with 45% reduction if you buy this rather than the five separate eBooks. It has been specifically designed to enable those seeking a management promotion to prepare as fully as possible in a short time frame, saving you time and money. The Management level eBook includes over 1,300 questions in 42 tests everything you will need for numerical, verbal, abstract, diagrammatic and spatial reasoning tests. Plus it provides detailed guidance on how to approach management personality questionnaires. 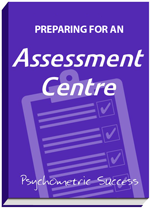 In addition as many organizations use Assessment Centers as part of their management recruitment it also contains an overview of what you can expect at such an event. It also describes what you need to do for each of the exercises you are likely to encounter in your day. 170 abstract & diagrammatic reasoning questions in 6 tests to practice with so that you can answer each of the 20 typical questions in 45 seconds or less! This shows your ‘natural’ ability to interpreting data trends and patterns. Completing all of the 42 tests and personality questions contained within this eBook will greatly improve your accuracy and speed. Our explanations, advice and answers will ensure that you maximize your tests scores and demonstrate your suitability for your chosen role.